Shoulder pathology is a growing concern for the aging population, athletes, and laborers. Shoulder osteoarthritis and rotator cuff disease represent the two most common disorders of the shoulder leading to pain, disability, and degeneration. While research in cartilage regeneration has not yet been translated clinically, the field of shoulder arthroplasty has advanced to the point that joint replacement is an excellent and viable option for a number of pathologic conditions in the shoulder. Rotator cuff disease has been a significant focus of research activity in recent years, as clinicians face the challenge of poor tendon healing and irreversible changes associated with rotator cuff arthropathy. Future treatment modalities involving biologics and tissue engineering hold further promise to improve outcomes for patients suffering from shoulder pathologies. As the elderly population expands, so do age-related orthopaedic disorders. This is of particular concern in the field of shoulder pathology, as both osteoarthritis (OA) and rotator cuff disease are degenerative conditions that increase in the aging population. These represent the most common causes of pain and disability, and have been subjects of research and treatment innovation in recent years. Arthritis of the shoulder can have a number of etiologies. Osteoarthritis, trauma, avascular necrosis, infection, and inflammatory arthropathies can all lead to loss of cartilage integrity and destruction of the joint surfaces. Loss of cartilage and incongruent joint surfaces result in painful articulation, necessitating orthopaedic treatment. Osteoarthritis is the most common cause of shoulder arthropathy and has been linked to age  and chronic overuse . Conventional treatment options include nonsteroidal anti-inflammatory medication, cortisone injections, arthroscopic debridement, and joint replacement. It is expected that the rate of upper extremity arthroplasty will soon double and lead to increased health care costs and societal burdens . Rotator cuff disease occurs in an age-related fashion and can exist along a spectrum, from rotator cuff tendinitis, to partial thickness rotator cuff tears, to full thickness rotator cuff tears. A recent study by Yamamoto and colleagues  demonstrated that the prevalence of cuff tears in a Japanese village was 20.7% for its general population; the risk factors identified for tears were history of trauma, arm dominance, and age. Others have shown that, in asymptomatic shoulders, an increased prevalence of tears is associated with increased age [5, 6]. Tears can enlarge with time, and the increase in tear size is associated with retraction of the muscle tendon unit, which can lead to changes in muscle architecture , joint mal-alignment, and altered biomechanics . Not all tears are symptomatic, although rotator cuff repair of painful tears is one of the most common orthopedic procedures in the US. In this review, we discuss the two major degenerative disorders of the shoulder, OA and rotator cuff disease, as well as new insights into how to treat these debilitating conditions. OA, also known as degenerative joint disease, is defined as non-inflammatory degeneration of the cartilage and narrowing of the glenohumeral joint space. Radiographic findings of glenohumeral OA include joint space narrowing, circumferential osteophyte formation, subchondral cyst formation, posterior wear or bone loss of the glenoid, and/or subchondral sclerosis. Arthritis of the shoulder has many etiologies, including primary (idiopathic) and secondary (post-traumatic or developmental). Primary glenohumeral OA is considered rare , yet it is becoming an increasingly recognized source of pain and disability in the shoulder. Overuse and trauma have been correlated with increased risk of developing degenerative joint disease . Increased intrinsic glenoid retroversion has been shown to lead to increased wear of the posterior glenoid, and these individuals are prone to earlier onset OA . Chronic overuse of the shoulder can lead to excessive wear of the articulating surfaces with eventual thinning of the articular cartilage . Post-capsulorraphy arthropathy is arthritis associated with surgical procedures for the treatment of instability, particularly from over-tightening of the anterior soft tissues of the shoulder. Over-tightening of the soft tissues leads to reduced external rotation and increased compressive load on the posterior articular cartilage of the glenoid, resulting in accelerated development of arthritis in the shoulder. Mal-positioned and migrated hardware, such as suture anchors or loosened screws, may also cause mechanical damage to the glenohumeral joint cartilage . More recently, thermal injuries from soft tissue shrinkage devices used during shoulder arthroscopy have led to chondrolysis, and eventual OA . The radiographic findings described above are in contrast to arthritis associated with inflammation (e.g., rheumatoid arthritis). Rheumatoid arthritis in the shoulder typically presents with medial wear of the glenoid, absence of osteophyte formation, large cyst formation, and osteopenia. The management of shoulder OA typically begins with nonoperative modalities before surgery is considered. The mainstays of non-operative treatment include oral and injected analgesics and anti-inflammatory drugs, physical therapy, and lifestyle modifications . The goal of physiotherapy is to increase joint range of motion and strengthen muscles of the scapular girdle. Arthritic joints are prone to stiffness, and the stiffness is often a source of pain. Joint infiltration of local analgesics, often combined with steroidal anti-inflammatory drugs, is common and is often performed in out-patient settings. Steroid injections and visco-supplementation may provide short-term pain relief and help physicians diagnose intra-articular pathologies [14, 15]. Such treatments are not without risk, however, and may lead to chronic degenerative changes to the joint and attenuation of the soft tissues in and around the joint . When nonoperative treatment options no longer alleviate symptoms and symptoms interfere with daily activities and sleep, surgical management is often considered (Table 1). Treatment options include arthroscopic debridement, cartilage repair, and biological and arthroplastic replacement . Arthroscopic debridement, with or without capsular release, may provide short-term relief of pain in the osteoarthritic shoulder; however, deterioration over time can be expected for most patients due to the loss of cartilage thickness and the inability to regenerate lost tissue. Some studies have demonstrated the benefit of this procedure as an early temporal bridge to arthroplasty [18, 19]. A major limitation to the consideration of an arthroplasty in a young patient is the longevity of the prosthesis. The rate of survival of a shoulder arthroplasty over the long term (15 to 20 years) is approximately 85% . For young patients, alternatives are considered in order to avoid future revisions. Biologic resurfacing with a soft tissue interposition with or without humeral head replacement has led to controversial results [18, 21–23]. Resurfacing with knee meniscus, Achilles allograft, anterior shoulder capsule, and other materials have all been reported. Early reports of biologic resurfacing were favorable, but recent mid-term results have indicated a high rate of failure and subsequent revision. Currently, glenoid resurfacing with biologic interposition is only recommended in young patients, in their third or fourth decade. Humeral head prosthetic resurfacing with stemless implants has also been considered in younger patients for humeral lesions . The rationale is that a smaller resurfacing implant preserves proximal humeral bone stock, in the interest of future revision surgery. While this procedure has the potential advantage of minimal bone loss without humeral canal reaming, it is specific to treating small focal lesions or isolated humeral head arthrosis and may have little application in the setting of more severe OA [24–26]. Total shoulder arthroplasty (TSA) is the gold standard treatment for severe glenohumeral OA . The growth rate for TSA continues to rise compared to other orthopedic joint replacement surgery rates . Approximately 45,000 patients in the US undergo total shoulder arthroplasty or hemiarthroplasty each year . A total shoulder arthroplasty involves replacement of the humeral head and prosthetic resurfacing of the glenoid (Figure 1). A hemiarthroplasty refers to humeral head replacement alone. Total shoulder arthroplasty for treatment of severe glenohumeral osteoarthritis. (A) Pre-operative radiograph of an arthritic shoulder with typical loss of normal joint space. (B) Post-operative radiograph after total shoulder replacement of both humeral head and glenoid components. (C) Post-operative radiograph of a shoulder with a reverse shoulder arthroplasty for rotator cuff arthropathy. Total shoulder arthroplasty offers reliable pain relief, predictable improvement of function, and improved quality of life for a variety of shoulder arthropathies, including primary OA . The main concern with TSA is the potential for loosening of the glenoid component over time, as this represents the most common complication [29, 30]. Fixation  and material composition  are also factors related to the success of prostheses, as dierent materials and implantation methods may influence osteolysis and risk of arthroplasty revision. Recent results, however, support the longevity of poly-ethylene glenoid resurfacing . Improvements in glenoid component materials and engineering are an on-going subject of research. Hemiarthroplasties are used mostly for select cases of arthritis, such as OA in a younger individual and rheumatoid arthritis in which bone loss precludes implantation of a glenoid component and rotator cuff arthropathy [28, 33]. In general, hemiarthroplasty demonstrates inferior results when compared to TSA [27, 34–36]; how-ever, such procedures may be more appealing in certain settings, such as for very young patients, patients with severe bone loss, and patients with avascular necrosis involving only the humeral head . A reverse shoulder arthroplasty is arguably one of the most important contributions to the treatment of certain shoulder arthropathies in the past several years. Reverse total shoulder arthroplasty is indicated primarily in the setting of rotator cuff insufficiency and rotator cuff arthropathy, but has also been used for fracture treatment, revision of failed shoulder arthroplasty, and sequelae of trauma. Reverse TSA prostheses have a ball-in-socket design, with a semi-circumference ball being implanted in the glenoid and a stem with a concave polyethylene cap implanted in the humerus (Figure 1). Rotator cuff arthropathy represents a spectrum of shoulder pathology characterized by rotator cuff insufficiency, diminished acromiohumeral distance, and arthritic changes of the glenohumeral joint . Reversal of the components changes the biomechanics of the construct, allowing overhead elevation in the absence of a rotator cuff. A competent deltoid is critical for a successful reverse shoulder arthroplasty, as this becomes the primary actuator of the shoulder. Recently, some surgeons have expanded the use of this prosthesis to treat other shoulder conditions, such as irreparable rotator cuff tears without glenohumeral arthritis and rheumatoid arthritis; preliminary studies have had favorable short-term results [28, 39]. Rupture of one or more of the rotator cuff tendons from the humeral head is one of the most common orthopedic injuries in the US, with over 250,000 repairs performed each year . Large rotator cuff tears, which include more than one of the rotator cuff tendons, lead to increased morbidity and probability of post-surgical repair-site failure . Additionally, many factors may perpetuate the likelihood of a failed repair, including age, gender, severity and duration of injury [41, 42]. Regardless, the predictability of failure and the factors associated with impaired healing and reduced strength of the repaired rotator cuff are currently unclear. In both the clinic and in animal models, changes in muscle architecture and structure have been associated with chronic rotator cuff disease [7, 43, 44], and a role for rotator cuff muscle health and rehabilitation in healing repairs has been suggested [45, 46]. Following a rotator cuff tear, fatty accumulation  and atrophy  are thought to play a role in the reparability of the tendon-to-bone insertion, as these factors can lead to increased repair site tension due to tenomuscular retraction and muscle fibrosis . Recent animal studies have elucidated the pathomechanisms of fatty degeneration of the rotator cuff muscles after chronic cuff tears [49–51]. Rotator cuff tears in rodents led to accumulation of adipocytes, intramuscular fat globules, and intramyocellular fat droplets in the injured muscles (Figure 2). Adipogenic and myogenic transcription factors and markers were upregulated in the injured rotator cuff muscles, and the severity of changes was associated with tear size and concomitant nerve injury. The status of the rotator cuff by serial ultrasound examination after large and massive rotator cuff repairs has been used to potentially delineate failure mechanisms as having either mechanical or biological causes. High tension at the repair site immediately post-surgery may increase the risk for mechanical failure of the repair site . Failure of the repair site may also result from a lack of appropriate healing at the tendon-to-bone insertion . Improvements in both tendon-to-bone insertion strength as well as promotion of tendon-to-bone healing are precedent in order to advance the success of rotator cuff repair strategies. Fatty accumulation in a rodent model of chronic rotator cuff degeneration. (A) A normal rat supraspinatus muscle stained with Oil red O showing very few intramuscular fat deposits and intramyocellular fat droplets. The supraspinatus tendon can be seen at the center of the muscle (arrow) and the muscle fibers can be seen above and below the tendon. (B) The infraspinatus muscle of a rat 16 weeks following tenotomy of the supraspinatus and infraspinatus tendons. There are high numbers of fat deposits (seen as red dots). (C) The infraspinatus muscle of a rat 16 weeks following tenotomy plus neurotomy showing high levels of intramuscular fat. (A-C) Oil red O stain; 10× objective. (D) Histology grading results are shown for intramuscular fat on Oil red O stained histology sections. Normal muscles showed no fat. After tenotomy of the supraspinatus (SS) and infraspinatus (IS) tendons, the infraspinatus muscle had more intramuscular fat than the supraspinatus muscle. The 16-week specimens had more intramuscular fat than the 8-week specimens within each group. Note that grading was semi-quantitative in nature; statistical comparison and error bars were therefore not calculated. Reproduced with permission from . Treatment modalities for rotator cuff disease are dependent on the severity of degeneration and symptoms of the patient; various surgical treatment options are outlined in Table 1. While acute, traumatic rotator cuff tears can be treated surgically with high success rates and marginal morbidity, treatment of chronic rotator cuff disease is less promising. Surgical repairs of chronic rotator cuff tears are less likely to heal than acute repairs, and 30 to 94% of arthroscopic repairs of large, chronic rotator cuff injuries have the potential to fail, particularly within the first 2 years [40, 53]. Even with current repair techniques, including arthroscopic double-row repairs, failure rates post-repair remain high [54, 55], suggesting the potential role of aging and degeneration in recurring tendon-to-bone failure [56–59]. The healing tendon-to-bone insertion following rotator cuff repair is dissimilar to the native insertion, which demonstrates four distinct transitional zones: bone, calcified fibrocartilage, uncalcified fibrocartilage, and tendon. Instead, the healing tendon forms a fibrovascular scar tissue and is biomechanically weaker and more prone to failure than the native insertion . Even though patients symptomatically improve after surgically repaired rotator cuff tears regardless of the structural status of the cuff in the postoperative period, studies suggest a better clinical outcome when the repair remains intact and the cuff heals back on the greater tuberosity [40, 61]. Moreover, some investigations show that increased age, larger tear size, poorer muscle quality, delamination of the tendons, and longer follow-up are all related to lower healing rates and inferior clinical results [41, 42]. Miller and colleagues  recently investigated the potential mechanisms of failed repairs by verifying the chronological status of the rotator cuff using serial ultrasound examination after rotator cuff repairs. The great majority of the recurrent tears (seven of nine) occurred very early in the postoperative period, perhaps suggesting a mechanical cause for the failure. Nevertheless, it remains unclear whether mechanical or biological reasons are responsible for impaired cuff healing and failure. Efforts have been made in order to improve the initial fixation strength and to better recreate the normal anatomical footprint of the rotator cuff. The use of the double-row technique, or the addition of another row of suture anchors to the fixation construct to improve structural function and re-establish the rotator cuff footprint, has been implemented in recent years . While these techniques may lead to higher healing rates, multiple clinical studies have not shown a translation from improved insertion strength to better functional or clinical outcomes [63, 64]. It is likely that, even with the mechanical strength of the repair maximized, high failure rates are still prone to occur. Thus, exploring the underlying biological environment, while optimizing the present mechanical constructs, may drive the future success of rotator cuff repair. The development of therapies to improve the healing rate and functional outcomes after the onset of OA and rotator cuff damage is currently driven by several factors, including functional improvements in the strength of the repair, targeted biochemical signaling of the repair site to encourage the healing process, and establishment of native cartilage and/or tendon-to-bone insertion. Tissue engineering may provide avenues for encouraging growth, healing, and remodeling of injured musculoskeletal tissues, particularly of articular cartilage lining the glenohumeral joint and the tendon-to-bone insertion of the rotator cuff (Figure 3). The tissue engineering paradigm. 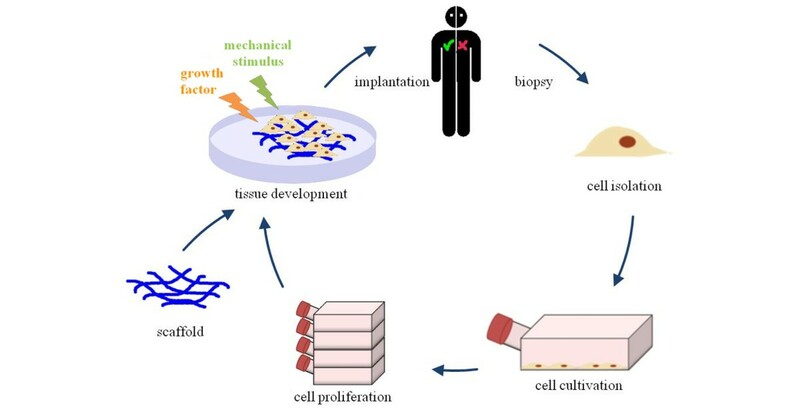 The tissue engineering paradigm consists of isolation and proliferation of a cell source, seeding of the cells onto a scaffold, stimulation of the cell-seeded scaffold to develop a tissue equivalent, and implantation of the construct in vivo. Figure reproduced under a Creative Commons Attribution 3.0 Unported license. While surgery remains the last resort option for treatment of severe shoulder degeneration, compelling reasons exist to prolong the need for arthroplasty solutions, especially in younger patients. Bioengineered devices, such as tissue engineered grafts, are currently being developed and may play a substantial role in the healing and structural maintenance of glenohumeral articular cartilage [23, 65, 66]. Most approaches incorporate one or more components of the tissue engineering paradigm described in Figure 3. Recently, Gobezie and colleagues  implemented an all-arthroscopic total shoulder cartilage resurfacing technique for treatment of advanced glenohumeral OA in young patients. Using osteoarticular allografts from cadaveric tibial plateaus and humeri, bipolar cartilage resurfacing demonstrated early success and rehabilitation . Similarly, Krishnan and colleagues  performed successful glenoid resurfacing with fascia lata autograft in some patients and Achilles tendon allograft in others. In this study, the use of allogenic resurfacing material showed promise for reducing post-operative pain as well as for excluding donor site morbidity that is observed when using autografts . Glenoid resurfacing has proven successful after 3 to 6 years following implementation of a xenograft patch seeded with pluripotent cells . However, due to progressive glenohumeral space narrowing, the durability of biologic soft tissue interposition grafts may present a long-term concern . Additionally, disease transmission and host rejection are potential issues when implementing biologically derived materials from allogenic or xenogenic sources. Nonetheless, chondrocyte and osteochondral plugs and articular grafts from autogenic or allogenic sources have successfully demonstrated their potential as biologic alternatives to debridement for the treatment of cartilage defects [13, 67–69], and more research is needed to better interpret their efficacy. A number of scaffolds have been used clinically in an effort to augment rotator cuff tendon-to-bone repair. However, a review of currently available scaffolds by Derwin and colleagues revealed that further work is necessary to optimize scaffold properties . Clinically available scaffolds lack an appropriate recreation of the native tissue's gradation in properties between the compliant tendon and the stiff bone. To address this lack of complexity, laboratory tissue engineering work has focused on a number of approaches. Biphasic  and triphasic scaffolds  have been generated and seeded with multiple cell types. These studies demonstrated the importance of signaling between the various tendon-to-bone cell types for generation of a functional insertion. More recent approaches have also attempted to create continuous gradients in composition and properties in order to recreate the interface that is seen at the natural rotator cuff tendon-to-bone insertion. To this end, electrospun polymer nanofiber scaffolds were synthesized with gradations in mineral, mimicking the mineral gradation seen at the native insertion . The gradation in mineral content resulted in a spatial variation in the stiffness of the scaffold. Similar results were reported using a cell-seeded collagen scaffold with a gradient in retrovirus encoding an osteogenic transcription factor . A tissue engineered scaffold with a gradation in properties and seeded with the appropriate cells and biofactors may ultimately provide a solution to the clinical problem of tendon-to-bone healing. Throughout soft tissue healing, several growth factors and catabolic molecules have been shown to regulate scar formation and remodeling . Such alterations in bio-marker production can provide insight into the normal biological response of the healing tendon, cartilage, and bone. The use and/or combination of exogenous growth factors, stem cells, and bioengineered scaffolds may demonstrate potential in encouraging healing and repair of the rotator cuff [76–80]. The use of individual molecules, such as bone morphogenetic protein-2 (BMP-2) and transforming growth factor (TGF)-β3, to aid cartilage and tendon-to-bone healing has been explored [78–85], yet it is likely more beneficial to incorporate a cocktail of growth factors to best promote healing, of which the constituents are currently unknown . Regardless, harmonious signaling initiated by both anabolic and catabolic factors during healing is what will likely drive the most successful repair to minimize scar formation and encourage the redevelopment of organized glenohumeral cartilage and tendon-to-bone insertion . A targeted approach for enhanced repair using single growth factors embedded in scaffolds has been attempted in animal models in an effort to enhance rotator cuff  and cartilage repair . Two recent studies demonstrated that TGF-β3 may accelerate healing [80, 87]. 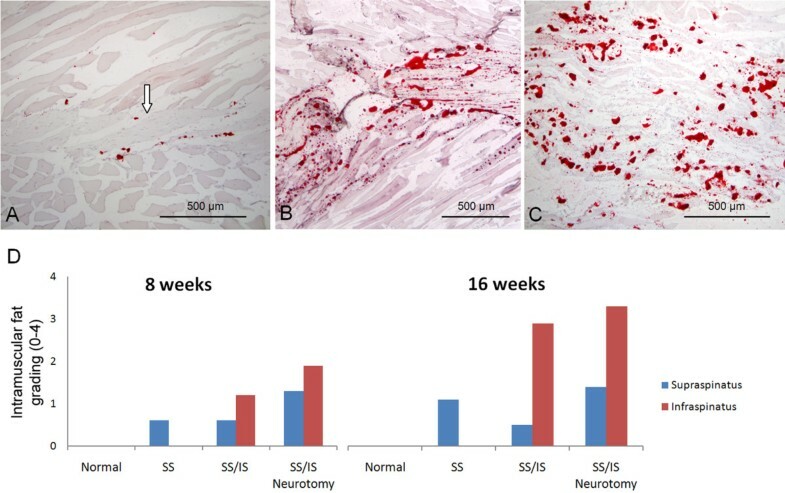 This growth factor has been implicated in fetal development and scarless fetal healing and, thus, addition of TGF-β3 at the repaired tendon-to-bone insertion may enhance healing. Manning and colleagues  used a scaffold with controlled release of TGF-β3 to encourage tendon- to-bone healing in a rat rotator cuff repair model. TGF-β3 treatment led to increases in inflammation, cellularity, vascularity, and cell proliferation in the early period after surgical repair. The growth factor also promoted improvements in mechanical properties compared to controls. Cellular and gene transfer approaches have shown promise for improving rotator cuff repair as well. Gulotta and colleagues  delivered mesenchymal stem cells (MSCs) to the rotator cuff repair site in rats, but did not see improvements in healing. Positive results were only seen after MSCs were transfected with scleraxis (Scx), a transcription factor that is necessary for tendon development . Rotator cuff repairs that received Scx-transfected MSCs had higher strength and stiffness compared with the non-transfected MSC repairs. In a similar study, MSCs transfected with membrane type 1 matrix metalloproteinase (MT1-MMP), a factor that is upregulated during embryogenesis at tendon-bone insertion sites , showed significant improvements in healing compared to controls. Increased fibrocartilage production was noted at the repair site along with improvements in mechanical properties. Although both targeted growth factors and MSCs show great promise for enhancing rotator cuff repair, further safety and efficacy studies are needed to determine if results from animal studies can be applied effectively in the human surgical setting. Recently, great interest has been given to biologic augmentation with platelet-rich-plasma (PRP). PRP is a solution of concentrated platelets prepared from autologous blood that contains numerous growth factors, including platelet-derived growth factor (PDGF), vascular endothelial growth factor (VEGF), and TGF-β1s . Such factors make PRP an attractive option for the enhancement of recruitment, proliferation, and differentiation of cells in the repair site of soft tissue damage. The creation of higher-quality tissue at the repair site would likely enhance healing rates and clinical outcomes . However, recent studies have demonstrated conflicting reports on the efficacy of exogenous supplementation of PRP for improving healing rates and improving clinical and functional outcomes [91, 92]. In rotator cuff repair augmentation, Castricini and colleagues  recently investigated the use of PRP on patients with small or medium tears. In this study of patients with small (<1 cm) and medium (1 to 3 cm) rotator cuff tears, augmentation with PRP at the time of rotator cuff repair did not improve Constant scores, tendon footprint thickness, or tendon thickness compared to repairs that were not augmented . On the other hand, Randelli and colleagues  recently showed an accelerated improvement in clinical scores 3 months after surgery for patients treated with PRP at rotator cuff repair compared to those not treated with PRP. Patients treated with PRP also demonstrated reduced pain scores at 3, 7, 14, and 30 days post-operatively . There was no difference in clinical scores or healing rates at longer-term follow up. Barber and colleagues  showed lower re-tear rates after rotator cuff repair with the use of platelet rich fibrin matrix, but interestingly, there was no difference in clinical outcome scores. Currently, use of PRP has marginal clinical support for treatment of rotator cuff repair or cartilage healing , and while PRP is a safe treatment for clinical use, its efficacy remains debatable. Degenerative conditions of the shoulder remain a significant source of pain and disability in the general and aging populations. The burden of arthritis and rotator cuff disease makes them prime topics for basic and translational research. While total shoulder arthroplasty remains the last resort for treating severe glenohumeral disorders, such as OA, other therapies are emerging to aid in improving healing of native tissues. Tendon research has focused on preventing failures of rotator cuff repair and augmenting the biological healing of the rotator cuff. Many potential therapies hold promise, and the implementation of new technologies such as bioengineered scaffolds, novel stem cell sources, and controlled-release growth factors will likely navigate the future of treatment modalities for shoulder pathologies. The authors received support from the National Institutes of Health (AR057836).